It was December 1980 and I was getting ready to go home to Dayton, Ohio for Christmas from my apartment near Ohio State University. It was a frightening time; John Lennon had just been gunned down in cold blood several weeks earlier and everything seemed scary. How could something so horrible have happened? The Beatles were music to me. I could not remember a time when they did not exist. And now some crazy, selfish egomaniac took all of that away with a few pulls of the trigger. That is the way it felt then. A great man had been robbed of his life at only 40 years old. Someone had stolen my music. The music was over and there was nothing I could do about it. When I was leaving that day, for some reason, I hid all of my Beatles albums in the back of my closet. I thought that those albums were all I had left of the Beatles, of my music. And I thought that someone would come into my apartment when I was gone and steal those albums too. As the weeks went by and 1981 began, I did not want to feel that everything I loved about music was over. To attempt to get out my post-murder depression, I wanted to find something positive to look forward to, some new music that was just as good as the Beatles, even better maybe. I wanted to believe in a band that was currently making music, not a band that had broken up and whose driving force had been murdered. I had read in Rolling Stone magazine that The Clash were “The Only Band That Matters.” So, I went out and bought Sandinista! in early 1981. 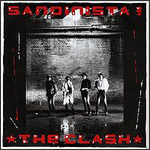 The Clash had released Sandinista! on December 12, 1980, just four days after John Lennon was murdered and when the world was still in raging mourning. And I discovered that Sandinista! is an album that delivers on the promise of rock and roll. It was incredible and mind-expanding! The Clash’s messages were not Lennon-esque (all you need is love, give peace a chance). Instead they reported on the injustices that exist in the world, advertising them so that they can be addressed … because rock and roll is the best way ever invented to get people to feel passionately about something. The Clash learned that from the Beatles and exploded it to the next generation. In Sandinista!, The Clash sang about revolution, capitalism, the Cold War, super powers, murder, misery, injustice, Washington bullets, labor, and religion—not just silly individual problems. The melodies are beautiful, but the rage is on the surface, not hidden or sugar coated. You can hear it in Joe Strummer’s voice. Mick Jones screams it. The Clash’s music isn’t just punk. It is reggae, rock, and ska, mixed with folk music. It is wild and rebellious and strange and international sounding. With some very cool guys delivering the messages. In the Summer of 1981, I visited New York City. I walked by the Dakota—John Lennon’s home and the site where he was murdered. I walked the same paths that John Lennon walked through Central Park across from his home. I also was fortunate enough to be able to see The Clash perform live at the Bond International Casino. They played many of the songs from Sandinista!. I remember feeling the power of their performance. I snapped a few blurry photos of the band, and on the way home I guarded that roll of film like a valuable treasure. Who made them so fat? The Clash may not have sounded like the Beatles, but rock and roll mattered to them. On Sandinista!, they demonstrated that music is powerful and can change the world. It still can and still does. To me, Sandinista! meant that even though John Lennon was gunned down, rock and roll was going to live on.